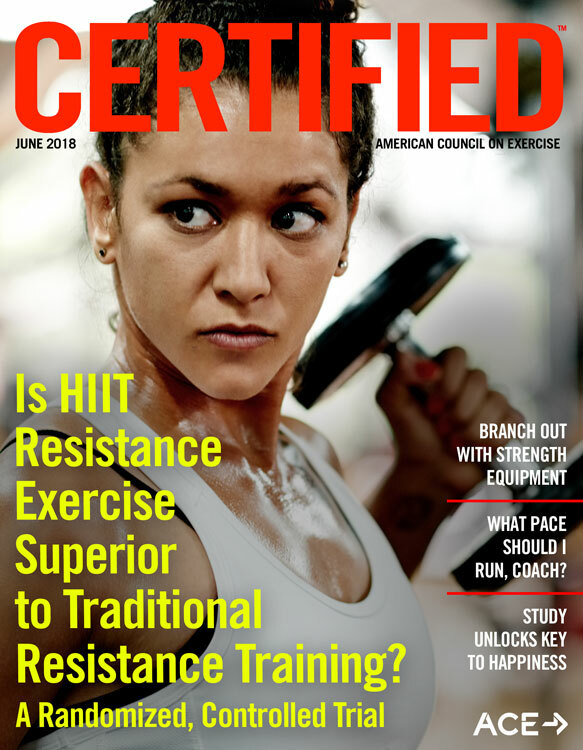 ACE - Certified™: June 2018 - ACE-SPONSORED RESEARCH: Is HIIT Resistance Exercise Superior to Traditional Resistance Training? The appeal of high-intensity interval training (HIIT) is obvious: It promises equal or better results in less time than traditional training programs. Couple that with the fact that “lack of time” is a primary reason people give for not exercising regularly and you see why evaluating the effectiveness of HIIT has been the topic of a considerable amount of research in recent years. Much of the focus of HIIT in both research and practice has been on aerobic exercise, and for good reason. HIIT aerobic exercise has repeatedly been shown to improve cardiorespiratory fitness and vascular function in a time-efficient manner. However, there has been a lack of research that looks at resistance training through this same lens. To address that gap in the literature, ACE enlisted the help of Lance Dalleck, Ph.D., and his team of researchers in the High Altitude Exercise Physiology Program at Western State Colorado University to evaluate the effectiveness of applying the HIIT paradigm to resistance training. The purpose of this study was to (1) compare muscular fitness and cardiometabolic outcomes between HIIT resistance exercise (HIIT-RE) and traditional moderate-intensity exercise (MI-RE) and (2) compare the timing of training adaptations between HIIT-RE and MI-RE. HIIT, which has traditionally been used with aerobic modalities, involves alternating between brief bouts of high-intensity exercise lasting 30 seconds to five minutes with either rest or lower-intensity work during an exercise session. This type of training allows for shorter workouts, yet provides results that are equal to, and often better than, traditional moderate-intensity steady-state training. The researchers recruited 48 nonsmoking men and women ranging in age from 21 to 59 years old. All participants were low-to-moderate risk and reported no resistance training within the previous six months. They were instructed to maintain their dietary habits for the duration of the study and to avoid any exercise beyond that required for the research. In addition, each participant’s muscular fitness was assessed before the study began, after three weeks of training, and after the six-week program ended. As a warm-up, each participant performed 10 repetitions with a weight he or she felt comfortable lifting (40 to 60% of an estimated 1-RM), followed by a one-minute rest period. As a second warm-up, the participant performed five repetitions at a weight equivalent to 60 to 80% of his or her estimated 5-RM, followed by a two-minute rest period. A 5-RM attempt was made at a weight 2.5 to 20 kg greater than was used in the second warm-up. If this first lift was deemed successful by the researcher, the weight was increased until the maximum weight the participant could lift was established, with three minutes of rest between attempts. If the first lift was deemed unsuccessful by the researcher, the weight was decreased until the participant successfully lifted the heaviest weight possible. A 1-RM attempt was then made at a weight 2.5 to 20 kg greater than the participant’s 5-RM weight. If the first 1-RM lift was deemed successful by the researcher, the weight was increased until the maximum weight the participant could lift was established, with three minutes of rest between attempts. If the first 1-RM lift was deemed unsuccessful by the researcher, the weight was decreased until the participant successfully lifted the heaviest weight possible. There were two to three minutes of rest between 1-RM and 5-RM attempts and a maximum of three attempts each to determine the 1-RM and 5-RM. There were three minutes of rest between the 1-RM and 5-RM testing of each resistance exercise. The researchers watched for proper lifting form throughout these assessments. After the completion of baseline testing, the participants were randomly assigned to one of three groups: a non-exercise control group, a HIIT-RE group or a MI-RE group. Those placed in the resistance exercise groups performed six weeks of exercise training. The MI-RE group completed a moderate-intensity resistance-training program based on standard industry guidelines, while the HIIT-RE group completed workouts based on their 5-RM at each exercise (Table 1). As you can see, the HIIT-RE group performed one set of five repetitions of each of the 10 exercises for the duration of the program, while the MI-RE group performed one set of 10 repetitions for the first half of the program and then two sets of 12 repetitions for the second half. According to Dalleck, the HIIT-RE workouts took 20 minutes or less to complete, while the MI-RE workouts took about 45 minutes to complete. The physical and physiological characteristics for the 45 participants who completed the study (three dropped out for reasons unrelated to the research) are presented in Table 2. 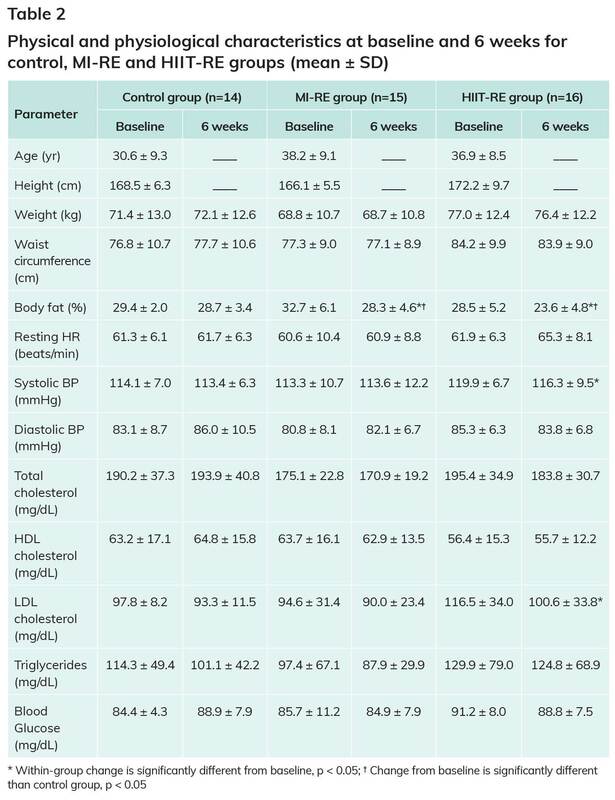 Note that body-fat percentage decreased significantly for both resistance-exercise groups, while systolic blood pressure and low-density lipoprotein (“bad”) cholesterol decreased significantly in the HIIT-RE group only. For the HIIT-RE group, all measures increased significantly from both baseline-to-midpoint and again from midpoint-to-6 weeks. In the MI-RE group, nearly all 1-RM and 5-RM measures increased significantly from both baseline-to-midpoint and again from midpoint-to-6 weeks; the exceptions can be seen in Tables 3 and 4 (i.e., those exercises without asterisks). HIIT-RE improved muscular fitness in a time-efficient manner, as it required less than half the time of MI-RE to achieve favorable adaptations. The average HIIT-RE session (including warm-up) was 20 minutes in duration. In contrast, the average MI-RE session was 45 minutes in duration. Preliminary evidence suggests that HIIT-RE improves muscular fitness in a more rapid timeframe when compared to traditional MI-RE. Indeed, for a few MI-RE exercises (i.e., chest press and leg extension) there were no significant improvements in 1-RM and 5-RM values until after six weeks of training. In contrast, all 1-RM and 5-RM values improved significantly at three weeks in the HIIT-RE group. The achievement of such rapid results is important to highlight, as seeing these gains in only three weeks may improve the motivation levels of many clients during the early phase of a new workout, when they are typically most prone to frustration and dropout. Overall, the results of this study are encouraging and support the tremendous potential to implement HIIT-RE into the exercise programs of adults who “lack time” to exercise. 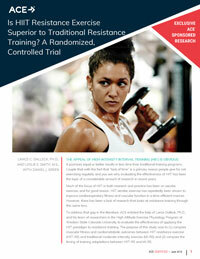 According to Dalleck, HIIT resistance exercise is certainly a viable option for clients who are strapped for time. It’s important to note that muscular fitness is an independent and powerful predictor of chronic disease and premature mortality, so the benefits of this type of workout extend far beyond strength or aesthetics. These preliminary findings are important for exercise physiologists, health and exercise professionals, and others who design exercise programs and promote physical activity in the adult population. 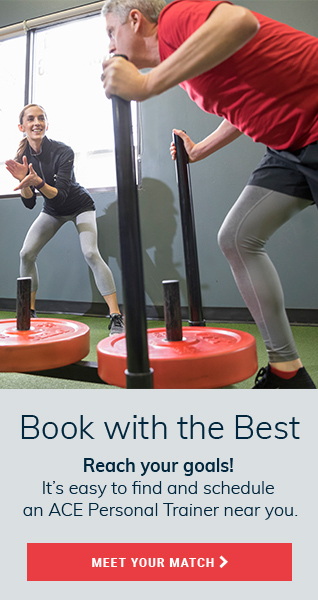 Finally, by using the 5-RM protocol utilized by the HIIT-RE group with their clients, health and exercise professionals are providing individualized programming based on the ability and skill level of the client. Rather than using a trial-and-error approach in the early stages of a program, the 5-RM protocol allows you to get results more quickly. As this study demonstrates, HIIT resistance exercise certainly checks the first two boxes. While there were no issues reported by the participants in this study, safety should be a top priority for anyone adding HIIT to their training regimen. Health and exercise professionals should remind clients to focus on proper lifting technique and breathing patterns, not only when first learning the movements, but also when performing them during exercise sessions. While there is a considerable amount of research demonstrating the benefits of aerobic-based HIIT, there is considerably less research on applying the HIIT paradigm to __________________. Among study participants in the resistance-exercise groups, ________________ dropped significantly after the six-week program. One of the key takeaways from this research is that HIIT-RE is __________as traditional MI-RE at improving cardiometabolic health and muscular fitness. Overall, the results of this study are encouraging and support the tremendous potential to implement HIIT-RE into the exercise programs of adults who ___________________.